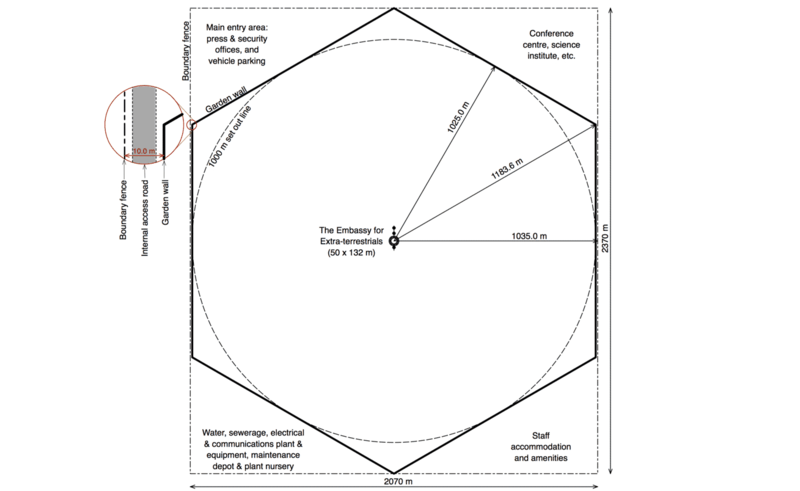 There are both planning and architectural requirements and certain conditions regarding the safety and security of the Extraterrestrials who will use the embassy. For safety and security purposes, the land on which the embassy is located must be considered neutral territory by the host country and by all other nations and the airspace located above and surrounding the embassy must not be subject to direct military surveillance, or monitoring carried out by radar or other means. ● It must have an area of at least four square kilometers. ● It must be located in a pleasant country with a warm climate. ● It must have extraterritoriality and diplomatic immunity that even the smallest state is entitled to for its embassy. ● The building is to be approximately 132 meters long by 49 meters wide. ● It must be built in the middle of a park, with a minimum distance of 1,000 meters from the wall surrounding the lot to the Embassy building, thus providing privacy for both the residence and the swimming pool. ● The enclosing wall must have two points of entry, one on the northern side and the other on the southern side. The residence itself must also have two entrances. ● The roof of the residence must contain a terrace on which a machine twelve meters in diameter can land. Access from this terrace to the interior is essential. ● A swimming pool is also essential. ● The residential area must contain seven living quarters, each with its own bathroom, ready to receive visitors. ● The building must have a conference room and dining room, each large enough to receive at least 21 people.